Your author isn't much of a shopper for various reasons - mainly that it isn't that enjoyable - but it is welcome when shops are trying to do something a bit different, and the experience at Things British in St Pancras Station was positive yesterday when he popped in following a tip-off from Jane of Amelia Parker, who creates jewellery from bits of clay pipe she finds on the Thames foreshore, and is currently renting shelf space at the shop. The shop - which has a sister store on Carnaby Street - sells hand-crafted items made in England, Scotland and Wales by allowing creators to use the shelves and surfaces within to showcase British designs of one-of-a-kind crafts and gifts. 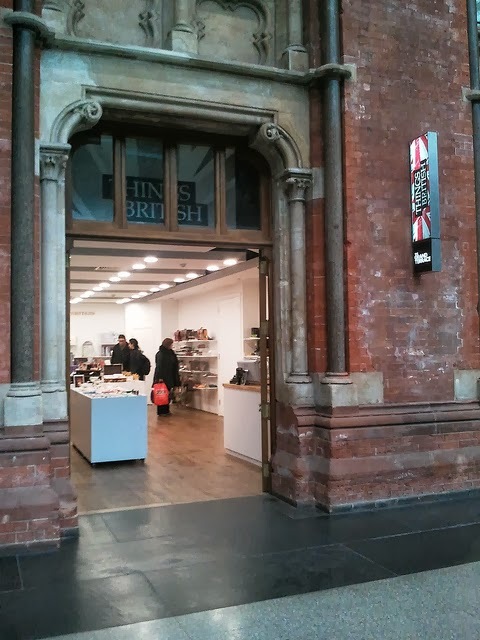 It's a noble endeavour, showcasing British craft and design on a collaborative model that still aims to make a profit, and whilst things on the first floor of St Pancras International were typically quiet, a few interested souls were coming through the doors. One gripe, however, is that it seems rather counter-intuitive that so few of the contents were adequately labelled. Surely if the shop-owners could do something simple to fix this they would be likely to sell more.